1. 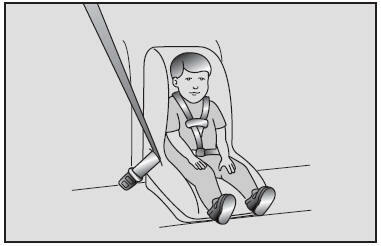 Place the child-restraint in the desired position. Route the lap/ shoulder belt through the restraint according to the seat manufacturer’s instructions. 2. Insert the tongue plate into the buckle. 3. Adjust the lap/ shoulder safety belt for a snug hold on the child restraint by pulling on the loose end of the belt.